Some people have inquired why I did not have a picture of a tree accompanying my Arbor Day entry. That was intentional. Maybe some people don't "get" my subtle humor. Maybe some people don't think my subtle humor is funny. Maybe some people think that I am funny looking and a bad poker player. My response to any of the above is "tough toenails". 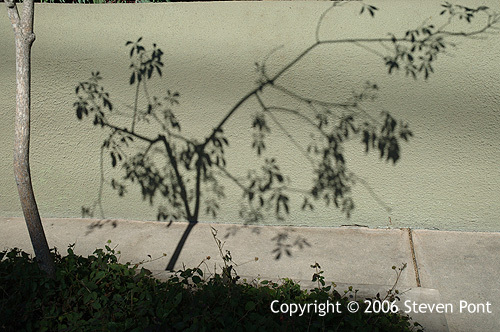 To quell the uproar (yes, based on my average traffic, I consider one reply to be an uproar), here's your damn tree picture -- or at least the shadow of one. No, don't check your calendars. You haven't missed Arbor Day and you still have time to go shopping for the big Arbor Day party. It's still a few weeks away -- Arbor Day is April 28th this year. You all know what Arbor Day is, don't you? 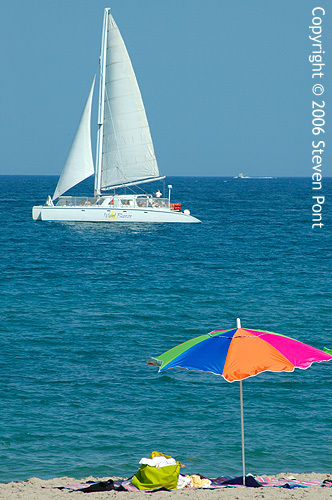 Of course -- that's when all the ships come sailing into the arbor! * Thank you, thank you. I'll be here all week. Try the veal. * I stole this from "It's Arbor Day, Charlie Brown", so blame Charles Schultz if you didn't like the joke. ... or very messy, depending on your point of view. From the parent's perspective, it is definitely the latter, although I am torn between wanting to let my kids enjoy themselves in the kitchen and have fun while creating good things to eat, and not wanting my kitchen to look like a disaster area. When it's time to clean up, the children, for some reason, are nowhere to be found (which is probably a good thing, since things often look worse after the children clean them). 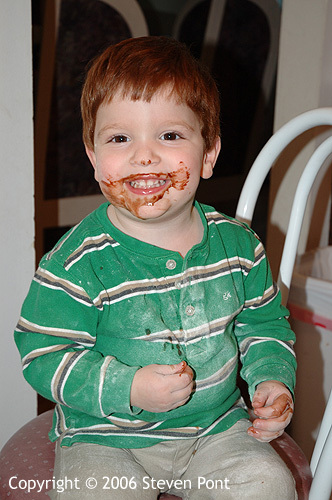 The above was the aftermath of a brownie-baking session. The kids aren't getting any neater, but they are starting to learn what they can and cannot put in their mouths. Sugar - good. Salt - good. Flour - not so good. Cocoa powder - blech.